You can spend your entire life without these little dumplings and not even know what you’re missing. I thought gnocchi were heavy, starchy dumplings that I could live without. A trip to Italy changed all that and now gnocchi is part of my standard repertoire. If you enjoy working with dough, as I do, making gnocchi is especially satisfying. The soft dough is kneaded when the potatoes are still warm, which pleases my thick hands. 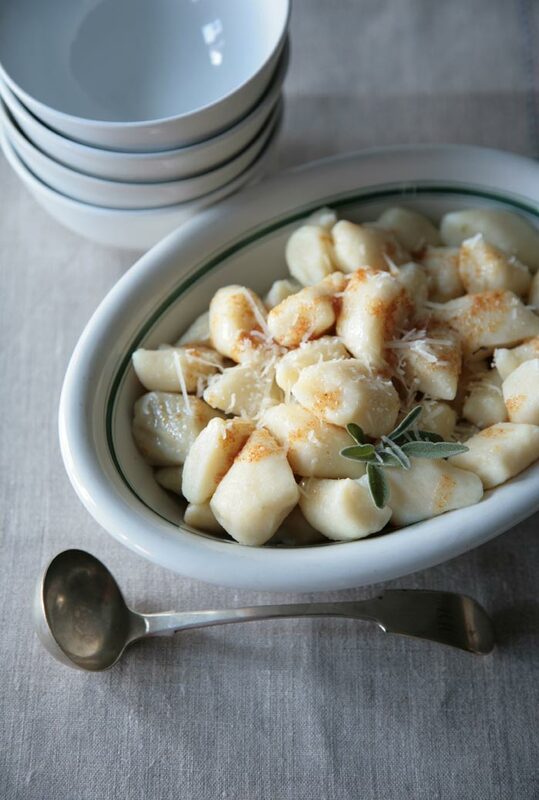 Gnocchi can be prepared in advance and re-heated just before serving. If I’m serving more than two, I make it in advance, so I’m not stuck at the stove, fishing dumplings out of a boiling pot, while my hungry guests wait. Gnocchi goes well with just about any sauce imaginable but sometimes I like it with a simple brown butter flavoured with sage leaves and topped with freshly grated Parmesan cheese. Recipe adapted a potato gnocchi recipe from Rosso & Lukins’ The New Basics Cookbook. A ricer for processing the potatoes. If you do not have a ricer you can use a food mill, or cheese grater, but a ricer makes the lightest gnocchi. A slotted spoon or small sieve for removing gnocchi from boiling water. The potatoes can be baked or boiled in their skins, until tender. Baked: Place (whole) potatoes on a rack in a preheated 375F oven until tender, about 45 minutes. Boiled: Place the (whole) potatoes in a large pot of cold water. Bring them to a gentle boil and cook until the potatoes can be easily pierced with the tip of a knife, about 45 minutes. When the potatoes are cooked enough to work with, peel them. While the potatoes are still warm, press them though a ricer, food mill or cheese grater. Place the milled potatoes in a large bowl. Add the whole egg and about half the flour. Mix together with a fork until a soft dough forms. Turn the dough onto your work surface. Pour the remaining flour on a work surface near the dough. (You may not need all the flour.) Using your hands or a pastry scraper, gradually incorporate just enough flour to form a soft, pliable dough. Gently knead the dough until soft, about two minutes. Divide the dough into 8 portions and roll each portion into a rope about ¾” thick by 12” long. Line up the “ropes” and cut into 3/4” pieces. You may leave them shaped as is for a rustic look or you can press them with the tines of a fork or a small wooden gnocchi paddle. (The indentations help the capture the sauce.) Lay the pieces on a floured baking sheet, with enough space between them so that they are not touching. Bring a large pot of salted water to a boil and, with a slotted spoon nearby, gently drop the dumplings into the boiling water in batches being careful not to overcrowd the pot. The gnocchi cook very quickly — this is not the time to pour another glass of wine. If you don’t retrieve the gnocchi as they float to the water’s surface, they’ll fall apart. Have a slotted spoon ready and don’t leave your station. There’s time for wine later. 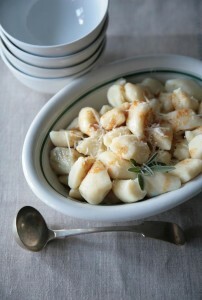 If not serving immediately, toss the just-cooked gnocchi into a bowl of ice water, drain it and toss with a bit of oil. They hold up for days in the refrigerator or weeks in the freezer. When you’re ready to serve, simply reheat the gnocchi in a saucepan with a bit of sage (or plain) butter. For a change, I sometimes sauté the gnocchi in a bit of oil until crisp and golden on the outside. Melt half the butter in a large sauté pan over high heat. Cook the butter until it begins to foam and turn brown. Add half the sage leaves and reduce the heat to medium. Continue to cook until the leaves are crispy, about 1 to 2 minutes. Remove the leaves and add about a cup of gnocchi to the butter and swirl in the pan until the dumplings are coated and heated though. Repeat with the balance of the dumplings and sage. Serve in warmed bowls. Sprinkle with Parmesan cheese and garnish with the crispy sage leaves. Denise…still missing French Mint in Victoria! No one has filled the void since you left…come back! You’re a sweetheart, Maureen. I still miss those lovely French Mint Days! Hope you’re still cooking your heart out. Happy to have found this online! The weather’s just turned, so I bought some Russets from the St. Lawrence Farmers Market this morning thinking this would be perfect for dinner tonight. Hoping mine turn out as pillowy and light as when I made them with you back at French Mint!